Roughly a year ago, Alex Kirilloff had to be feeling a little trepidation. Spring training was starting, and the former first round pick had missed all of 2017. Few knew the kind of season Kirilloff was about to embark on. During last off-season, none of baseball’s national prospect rankings had him in their top 100 lists. Now he is a consensus top-40 prospect. MLB and ESPN’s Keith Law have Kirilloff in their top-12 prospects. This is quite the jump for the former first round pick. What could that mean for the 2019 campaign? Kirilloff can hit. That might be the understatement of the century. He might be the best hitting prospect in the minor leagues not named Vladimir Guerrero Jr. He’s been hitting for his entire life, as his dad runs baseball camps and clinics. He could have shown some rust last season, but he quickly made it known that he would be a force to be reckoned with. He started the season in Cedar Rapids and hit .333/.391/.607 with 38 extra-base hits in 65 games. Among Midwest League hitters with at least 280 at-bats, his .999 OPS was the highest. Once he was promoted Fort Myers, he continued to hit. In 65 games in the Florida State League, he hit .362/.393/.550 with 33 extra-base hits. He led the Twins system in hits, doubles, and RBI. His 71 total extra-base hits and 296 total bases each led the minor leagues. At season’s end, the accolades came rolling in. The Twins named him the Twins Minor League Player of the Year and Twins Daily named him the Minor League Hitter of the Year. MiLB.com named him as the Breakout Prospect of the Year. He represented the Twins in MLB’s Futures Game during All-Star Weekend. He was also a midseason and post-season All-Star in the Midwest League. Kirilloff can spray the ball all over the field. His spray chart from last season is a thing of beauty (see below). Even with a left-handed swing, he has power to the opposite field. In fact, he had more doubles and more home runs to the opposite field than from pulling the ball. Kirilloff destroyed the ball last season so there was really no reason for him to try to draw a ton of walks. He is very aggressive at the plate and so his OBP was only slightly higher than his batting average. As he gets closer to the big leagues, hitting against more advanced pitchers could mean that he will need to be more patient. He knows the strike zone well and he will need to continue to prove that at Double- and Triple-A. On the defensive side of the ball, he played some center field in high school, so he has plenty of athletic ability. As he has bulked up in the minors, he has moved to a corner outfield spot. At some point, he might need to move to first base, but he has a good arm and should be able to stick in right field. OK, that might be a stretch, but his bat could carry him to Minnesota by season’s end. 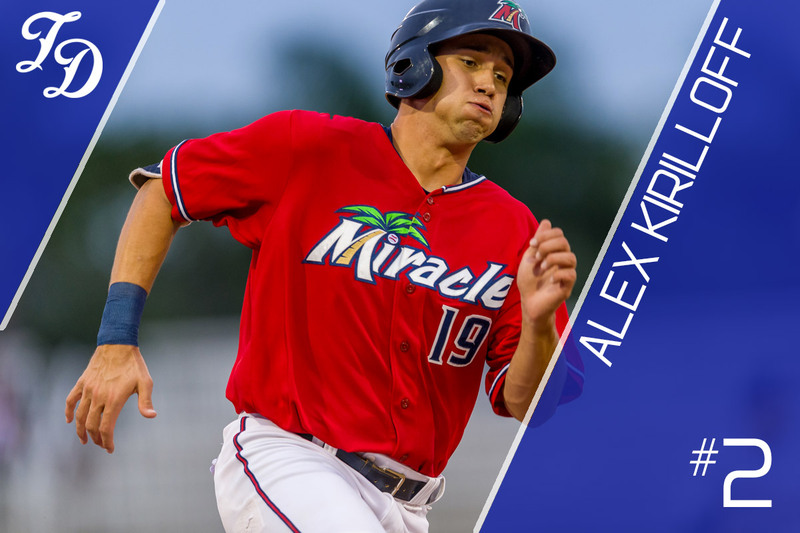 Minnesota could decide to keep him at Fort Myers to start the year, but it wouldn’t be much of a surprise if he started the year in Pensacola. Prospects of his caliber don’t necessarily need time at Triple-A so he could be called up directly from Double-A. Minnesota’s outfield is full at the moment with Byron Buxton, Max Kepler, and Eddie Rosario. However, an injury or poor play by one of these players could expedite Kirilloff’s timeline. Right now, I think his bat could hold its own at the big league level. Very exciting.Some motivation for Kepler and Buxton. Well, there won't be much drama as to who the #1 TwinsDaily prospect will be. I guess the only intrigue is who will get to write up the story....Tom, Cody, Seth or Nick? A 362/.393/.550 slash line in the FSL...a pitcher's league.Not too shabby. Great article. And yes, Royce was rated as a 65 FV on the Fangraphs top 130 that came out today, so that will be exciting too. A fantastic top two for the Twins. I was more impressed by the comment on Fangraphs that gave Kirloff a 15 - 20% chance to be the next Joey Votto.That is very high praise, now we shall see.I could see him being here if he starts in Pensacola between late 2019 and May 2020.One publication had him moving Kepler to first base or 4th outfielder or trade bait.Can't wait to see how he turns out. I really hope he starts in AA and just dominates for the first couple of months to earn a promotion. Once he makes it to AAA it’ll only be a matter of time before we get to see him with the Twins. I hope they are aggressive. I believe we are looking at 2021......I hope to be wrong on the timing. The number that blows my mind is 44-doubles in a five month minor league season.Unbelievable! I think there is a good chance your ETA is wrong.If he has a year at AA anything like last year, we gotta see him by September at the latest.Could be earlier if one of the starting three is out with an injury. If he has two great months, there's a very good chance he never sees AAA. Kirilloff doesn't have to be added to the 40-man roster yet after the 2019 season. My thought is that if the Twins are in contention in July, and Kirilloff is playing well, he comes up directly from AA. If they are out of contention, there is no reason to call him up in 2019, and they can call him up 3 weeks into the 2020 season. Seth (2), Nick (2), Tom (2), Cody (2). If it was Terry Ryan, he would be aggressive. I guess we don't know yet what the MO of this front office is, though they seem to also be quite aggressive. I will be shocked if it's closer to 2021 than 2019 with zero surprise if it is 2019. About another prospect, you said stats are just a piece of the puzzle. Here, you seem to be saying that stats alone will be what figures in his promotion. Can you clarify for us mortals when we're ok to consider stats, and when we're not? You'll have to remind me when I said stats are just a piece of the puzzle, because that is 100% true and I have probably said that many times.It is especially true in the lower levels. As for moving up to the big leagues, specifically if it's going to be straight from AA, then the guy really needs to be dominating the level. Now, there are more stats than what their used to be. They will have exit velocity and launch angles and spray charts and barrels and all kinds of stuff to show if a guy is truly hitting as well as his regular stats indicate. Whereas if we were specifically talking about a player's prospect status based on some numbers in like Elizabethton, the stats specifically aren't as important as the development plan and such. 18/19 year olds in short season ball, tools and projections mean more than performance. 21/22 year olds in AA, established tools plus performance mean youre ready to go. “Prospect rankings, however, typically have very little to do with the stats, though they do obviously factor in. And, I would hope people have not given up on Gonsalves at all. You'll have to remind me when I said stats are just a piece of the puzzle, because that is 100% true and I have probably said that many times. It is especially true in the lower levels. I think your latter statement was just hyperbole and we shouldn’t hold you to it, especially in the broader context of all of the great work you do tracking down and writing up all of the Twins prospects that we all like to follow during the dog days of winter (buy the prospect handbook!). All that said, I am still a bit perplexed how you feel like you aren’t considering stats that much when you go from ranking Gonsalves #1 in the system after an amazing statistical season in A+/AA, to #2 in the system after an exceedingly good statistical season in AA/AAA, to #11 after a similarly excellent statistical season in AAA with a 24 bad inning promotion to MLB. To me it looks like stats were a pretty big driver for those rankings. And to bring the conversation back to Kiriloff, as this is in the Kiriloff forum, let me point out the glaringly obvious fact that Kiriloff went from last year being unranked nationally but “he’s a great pure hitter” to this year, after an amazing statistical season, ranked in the top 20 nationally. Is a .333/.381/.525 two month slash line good enough? Or are those go to AAA numbers? I'd personally have AK 1 at this point. He's got the pedigree to go with the gaudy numbers. His bat plays more than Lewis's I think. That said, his Babip was really pretty high last season. He probably needs a few more walks, to turn on a few more pitches, and to turn more of those doubles into HR in order to sustain his momentum. If his value is peaking and we see him as Kepler 2.0, well we've got a lot of tough decisions coming up. I think he said stats become more important as you climb the ladder which would bear out with your Gonsalves example. Stats...smatz...AK is an awesome hitter. Can't wait to see him and the other Twins' prospects and players in 1 week at spring training. I can see it now. I'll be standing by a fence. watching practice. Suddenly a ball comes over the fence. I pick it up and throw a strike to home plate. A coach says: "Hey kid, come here. Where did you get that arm. Let me see you do that again" I throw another strike with movement. He puts me on the mound...same result. Castro is called over. He says he's never seen both speed and movement like this. The radar gun is reading 103. Excuse me TD reader, my office phone is ringing. Maybe it is Thad. I'll get back to this daydream later. So does he get to wear #47, or is that just too obvious? His absence from a lot of lists last year is a result of the injury. with no information about his development, a lot of people are going to significantly downgrade a prospect until they get back on the field. It's not a crazy decision either, sort of like giving someone an Incomplete rather than a letter grade. he made some national lists after his first season and now he's surged up the lists.